Tte English football club Brighton & Hove Albion became a member of the Football League in 1920. A 13th place in Division 1 in 1982 is so far the best result. They reached the FA Cup final in 1983 and lost against Manchester United. First match at the new named home field in 2011, against Tottenham. The club was founded in already in 1901, originally as Brighton & Hove United but soon changing to its current name. They started to compete in Southern League which they won once in 1910. The same year they won FA Charity Shield. They became a member of the Football League in 1920, when the Third Division was established. It was until the 1957-1958 season that the club won the Third Division and finally was promoted to the Second Division. The club would fall down to the Fourth Division in the 1960s. Better days came during the 1970s when the club first was promoted to Second Division and some years later, in 1979, for the first time to the First Division. After falling to the bottom of the league system in the 1990s, they started to climb and their first appearance in the top flight after the name change to Premier League happened after winning the Championship in 2017. 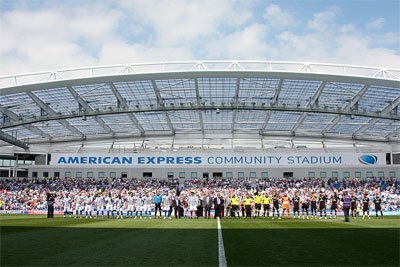 Since 2011, Brighton & Hove play at the Falmer Stadium, which has due to sponsorship reasons been referred to as American Express Community Stadium or Amex Stadium.